"Natural history of California" redirects here. For the book, A Natural History of California, see Allan A. Schoenherr. This article is about natural biological communities. For a description of human habitat adjustments, see Environment of California. ^ Ecological Regions of North America: Toward a Common Perspective (PDF). Commission for Environmental Cooperation. 1997. ISBN 2-922305-18-X. ^ "Mojave Desert". Terrestrial Ecoregions. World Wildlife Fund. ^ "Great Basin shrub steppe". Terrestrial Ecoregions. World Wildlife Fund. ^ a b "Level III ecoregions of the United States" (PDF). Retrieved 2012-10-24. ^ a b c "American Semi-Desert and Desert". Ecological Subregions of the United States. US Forest Service. ^ "California Chaparral & Woodlands". World Wildlife Fund. Archived from the original on 2012-10-08. Retrieved 2012-10-24. ^ a b c d "California coastal sage and chaparral". Terrestrial Ecoregions. World Wildlife Fund. 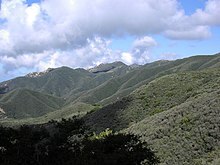 ^ a b c d "California montane chaparral and woodlands". Terrestrial Ecoregions. World Wildlife Fund. ^ a b "California interior chaparral and woodlands". Terrestrial Ecoregions. World Wildlife Fund. ^ Keeley, JE (2000). "Chaparral". In Barbour, MG; Billings, WD (eds.). North American Terrestrial Vegetation (2nd ed.). Cambridge University Press. p. 209. ISBN 978-0-521-55986-7. ^ "California Central Valley grasslands". Terrestrial Ecoregions. World Wildlife Fund. ^ "California Dry Steppe". Ecological Subregions of the United States. US Forest Service. Retrieved 2012-10-24. ^ "Restoring California's Native Grasses". United States Department of Agriculture. ^ Johnson, John (2001-05-13). "Conflicting Visions for 'Serengeti of California'". Los Angeles Times. ^ a b "Sierra Nevada forests". Terrestrial Ecoregions. World Wildlife Fund. ^ a b c d "Klamath-Siskiyou forests". Terrestrial Ecoregions. World Wildlife Fund. ^ a b "Eastern Cascades forests". Terrestrial Ecoregions. World Wildlife Fund. ^ Storer, TI; Usinger, RL (2004-09-01). Sierra Nevada Natural History. p. 20. ISBN 978-0-520-24096-4. ^ a b Schoenherr, Allan A. (1992). A Natural History of California. University of California Press. ISBN 0-520-06922-6. ^ Flint, WD (2002). To Find The Biggest Tree. Sequoia Natural History Association. ISBN 1-878441-09-4. ^ a b c "Northern California coastal forests". Terrestrial Ecoregions. World Wildlife Fund.